Lenormand daily draws are a great way to become familiar with card meanings and combinations. However, daily draws can be challenging because they require a different approach than other Lenormand readings. The cards will have very watered down meanings 99% of the time. As you know, major events like surgeries, deaths, and award ceremonies don't happen everyday. Cards that might indicate such events in a Grand Tableau will be much more minor, simple and literal in a daily reading. For example, Snake + Scythe might indicate surgery in a Grand Tableau. In a daily draw, it could refer to running over a garden hose with a lawn mower. The Clouds might simply mean a rainy day, while the Sun might point to warm weather. No matter how bad (or good) the cards look in a daily, try to use the most mild meaning possible. Dailies work best when you do them each morning. Try not to read the night before about what will happen on the following day. I wish I could give you a good reason why, but I've found that daily draws simply work better when you do them the morning of the day you're asking about. Maybe you're just in a better mindset when you do your reading the morning of the day in question…or you're less tired or muddled from the events of the previous day. I honestly don't have a good answer. I just know what works best from experience. The more precise your question, the more accurate your Lenormand daily reading will be. If you want to know in general how the day will go, you can ask, “What will happen today?” But understand that the answer can be about anything…or anyone. If you're curious about your day at work, you could ask, “What will happen at my work today,” for a general answer, or “What will will happen to ME at work today,” for something more specific. 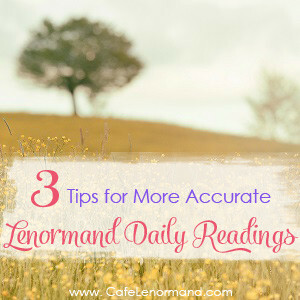 I hope these tips help you have more accurate readings when you do Lenormand daily draws. How Often Should You Read Lenormand Cards? You’re welcome Lizzie! I’m glad you like them. Thank you this great advice. Helps me keep focused on the more important stuff in my readings. The questions top, too. Because it is so easy to fall into asking a “yes or no” question. How many cards do you draw on a daily reading? People usually use 3-5 cards. I’m just starting out with Lenormand and I’m finding this site so helpful. Thanks for the great info! You’re welcome Kat! I’m glad it’s helping you. How many cards would you recommend a beginner draw for daily readings? Also, this site has been an amazing resource for learning about Lenormand, thanks! Hi Marissa, I’m so glad the site is helping you! If you’re a complete beginner, you should start with one card. As you become comfortable with the meanings and how the cards work, you can work your way up to 3 cards (the most cards usually used in daily readings).